You haven’t heard from me for a while, a long while I guess. I’ve been busy working at the By the Spoonful Soup Shop. And then of course, Sophie and I were married. You remember that, don’t you? 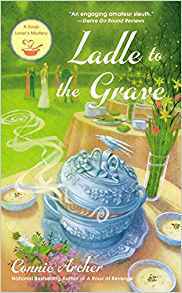 That happened in Ladle to the Grave. We had a wonderful wedding at Jack’s house and everyone we’re close to in Snowflake, Vermont was there. We still remember that day fondly. We’re having a baby now so I’m working as hard as I can to make sure we have enough money and everything is ready for our new little boy or girl. And before you ask, no, we don’t want to know. We don’t care. We just want our baby to be healthy and happy and loved! I’ve been busy creating new soups for the restaurant and continuing to cook some of our customers’ favorites. There’s still lots of snow on the ground in the village, but spring is coming. I can feel it. So today, I wanted to cook something other than a new soup. 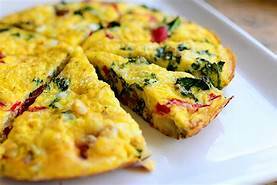 Today, I’m making a frittata, one of Sophie’s favorite recipes and whenever I make it at the Spoonful, Lucky and Jack and everyone tries a piece, so of course, there’s never any left for our customers. Parboil the chopped potatoes in a small pot until they’re almost, but not quite, cooked. Sauté the red onion and tomatoes in butter for 5 minutes over medium heat. Beat the eggs in a large bowl. Then add the potatoes, tomatoes and red onion to the beaten eggs and mix. Break up the frozen spinach and stir into the egg mixture. Add the cheddar cheese and salt and pepper. Gently mix all the ingredients together and pour the mixture into a large frying pan. Cover the pan and cook on medium heat until all the ingredients are hot and the eggs are cooked and the cheese melted. Slide the cooked frittata onto a pie dish and cut into 8 pieces. Quick and easy, isn’t it? I’m sure you’ll enjoy my recipe. If you do try it, tell me what you think, okay? Until next time, when I come up with a new soup! 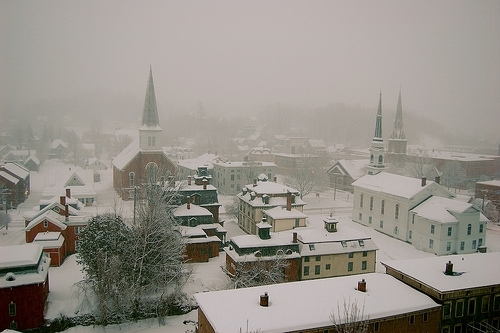 You can learn more about the Soup Lovers' Mysteries and all our stories at my author Connie Archer's website, at Facebook and Twitter @SnowflakeVT. Hello, Sage! I've missed you and the gang. When living in Spain w/my AF husband I learned to make their version of this, which is called a tortilla and is inverted onto a plate and then put back into the skillet to set. Always good on a chilly wet day like today. Hi Sally ~ I agree! Almost as good as soup, right? I realize I've been neglecting the Snowflake gang on Killer Characters, must let them talk some more! Sage - I’ve been waiting ti hear what’s been going on up there, I’ve been missing all you folks. I hope we’re going to get more new (a new book?) soon! Frittatas are great, aren’t they? My favorite is with leftover spaghetti, sauteed veggies, and cheese, topped with a drop or two of Tabasco just before eating. Delicious - even my picky eater likes it! Take care! Hi Anne ~ your recipe sounds great too! Thanks for stopping by and sharing!